At Cambridge, young Prince Alexis is accused of stealing the athletic fund money, but his classmate John Watson enlists the help of fellow student Sherlock Holmes, who quickly deduces the real culprit, a young man trying to get out of the clutches of master criminal Moriarty. 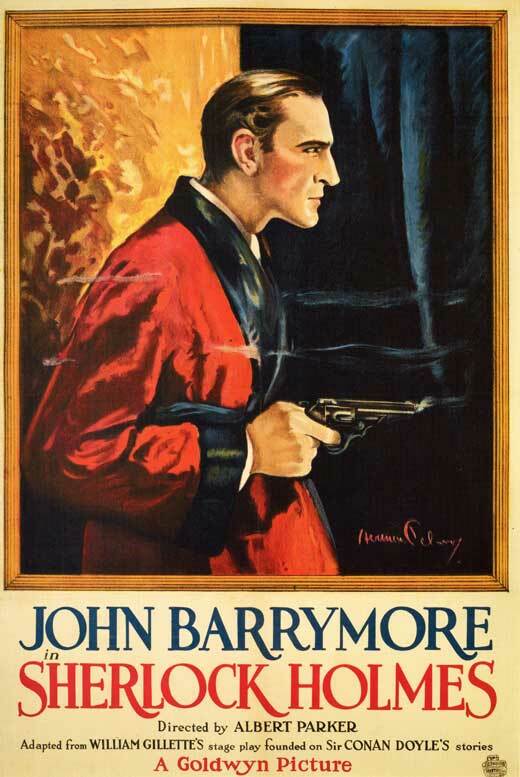 Getting an up-close look at the mastermind, Holmes dedicates his life to foiling his crimes. Unfortunately, while the prince is exonerated, his impending marriage to commoner Rose Faulkner must be canceled due to an accident placing him next in line for the throne. Years later, the late Rose’s sister Alice now has Alexis’s love letters to her sister. Though Scotland Yard cannot find Alice, one of Moriarty’s henchmen has located her and is holding her until he can get the letters from her for blackmail. Holmes takes the case when he learns Alice is the girl he fell in love at first sight with years ago, and also realizes that the letters are the perfect opportunity to draw Moriarty out of the hiding Holmes’s efforts have forced him into. When I realized the first act was going to be an origin story, I didn’t expect to like it. But it works. It sets up a lot of exposition the earlier film had to tell in pages and pages of intertitles. Love at first sight in a chance meeting on an unrelatedly portentous day is a bit contrived, but it’s more explanation than I remember in the previous version. Young Master Holmes casually knocking on Moriarty’s door to ask if he can study the man, then on the basis of what he’s seen in five minutes dedicating his life to destroying him is in my estimation quite in character for a youthful, arrogant, but principled genius. It’s a fantastic setup for the characters’ relationship where Doyle just says at the last minute, “by the way, Moriarty was a problem all along”, and the previous film says “by the way, Moriarty and Holmes have been at each others’ throats for years”. Alice also has a much more understandable reason to not wish to part with her sister’s letters: she intends to publish them to avenge her sister against the prince who wronged her. No blackmail, no “I keep my sister’s secrets safe by keeping them in a form anyone can steal”, just ruining the man for choosing royal obligations over love. Watson has possibly even less to do in this version than the other (though he gets to play Stamford’s role by introducing Holmes to the prince), but for what little we see, I kind of like Roland Young’s Watson. I get the sense he and Holmes are very good friends, and while Watson never understands where Holmes’s deductions come from at first, this Watson seems like he could get there eventually with enough time to work it out. Holmes just solved the puzzle faster. This version is altogether much better at showing the plot. The 1916 version has better individual scenes, but this one knows how to adapt them to fit a film’s pacing and technical weaknesses. The other photographed the play and summarized it in titles, this one tells the story in a way that the cards augment the story instead of explaining it. I’m not familiar with the conventions of films of the 1910s, but I wouldn’t be surprised to learn that was a teething problem for the new medium, and six years later, the long-form silent film was a much more defined form of storytelling. I feel like I’ve better experienced the play through a less faithful adaptation, but I’m definitely ready to move on to a different part of Holmes’s body of work.